Stock markets mostly moved higher on Wednesday as Canada expressed optimism as it rejoined talks on updating the North Atlantic Free Trade Agreement. 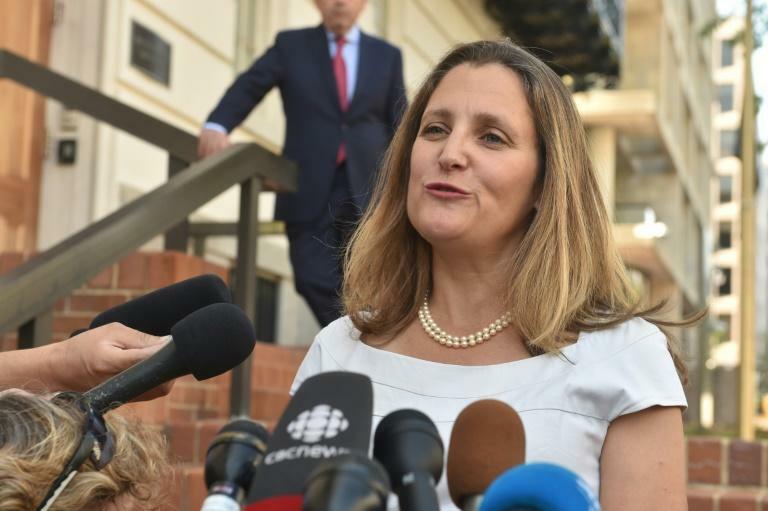 Canada's Foreign Minister Chrystia Freeland said she is "optimistic" they can make progress this week on revising the 25-year-old trade deal. Stocks have jumped higher this week on news that the United States and Mexico had resolved their differences on the pact and now Canada is rejoining the talks. "Equities are largely positive as traders are hopeful that trade talks with Canada will go well," said market analyst David Madden at CMC Markets UK. "Investment sentiment was driven higher by the new agreement with Mexico, and now the focus is on Canada as they are the last piece of the puzzle," he added. The Dow Jones Industrial Average was up 0.4 percent and the tech-heavy NASDAQ moved further into record territory. Also helping sentiment was the Commerce Department revising up its estimate of growth of the US economy in the second quarter, by a tenth of a percentage point to 4.2 percent, with new numbers showing a bigger boost in corporate spending. In Europe, markets were also affected by the European Union's top negotiator saying the bloc is willing to strike an "ambitious" deal with post-Brexit Britain far beyond any agreements made with other countries in the past. The main stock indices in Paris and Frankfurt both flipped higher after the announcement and closed the day 0.3 percent higher. The pound spiked higher, gaining over one cent to climb over $1.30. But as a stronger pound depresses earnings of many London-listed firms who make most of their sales abroad, the FTSE-100 ended the day 0.7 percent lower. "Strength in the pound, despite reports an October deadline for Brexit divorce talks is dissolving into a November deadline, saw FTSE 100 shares back off from a two-week high," said Jasper Lawler, head of research at London Capital Group. Meanwhile, the Turkish lira tumbled to its lowest value against the US dollar in two weeks, despite Ankara's attempts to reassure investors after Moody's downgraded its credit ratings on 20 Turkish financial institutions. The lira was trading at 6.44 to the dollar around 1530 GMT, a drop of around 2.6 on the day. It fell by a similar amount against the euro, trading at 7.54 to one euro. Lawler noted that Turkish bank shares fell alongside the lira on the Moody's rating action. "It is going to be increasingly difficult to get business done in Turkey under US sanctions and banks are the obvious pressure point in markets," he said.